Nails Inc polishes has been on my wish list for such a long time thanks to Vivianna Does Makeup and in December I finally got the chance to try them out. 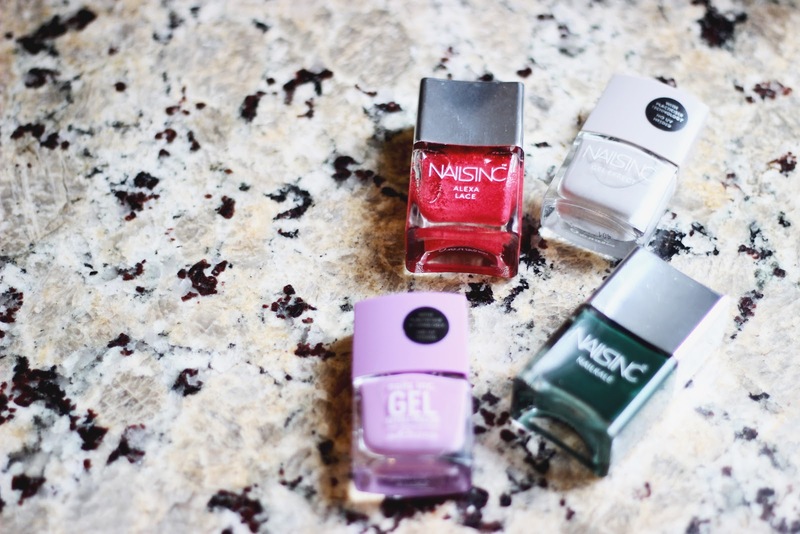 As a nail polish addict, I always get excited to try out a new nail polish range especially one as hyped as Nails Inc. I managed to find some bottles on sale recently because all of the bottles will be getting a little chic makeover so they can have the same luxe look as the Nail Kale range. The formula has to be one of the best I've encountered, and the brush makes it incredibly easy to get even coats of color. I currently own three nail colors and one glitter, but you already know that I'm thinking of more colors to pick up. I think it's safe to say that Nails Inc has completely stolen my heart. 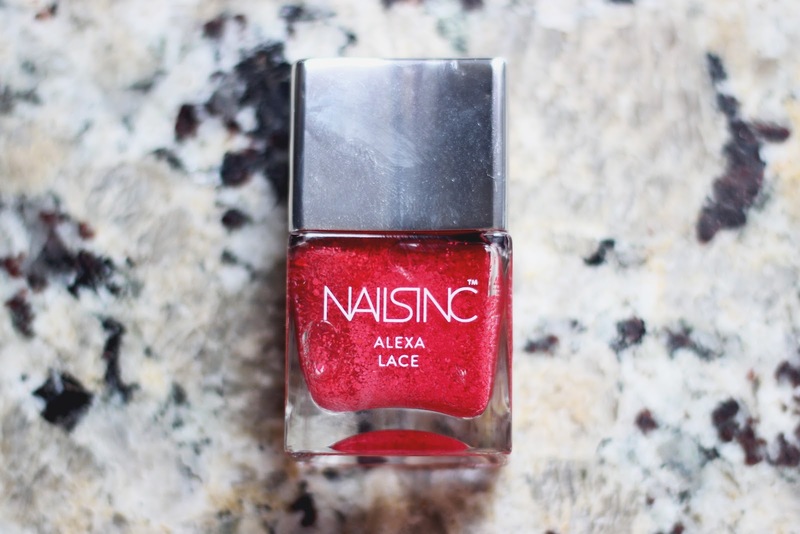 Alexa Lace is a red glitter polish with different sized particles. This particular glitter polish was part of the Alexa Chung x Nails Inc collaboration and it's meant to be layered on top of other polishes. The different sized particles are meant to mimic the effect of lace, but to be honest it doesn't really look like lace at all. I still love Alexa Lace but I'm going to use it very sparingly since it's very hard to remove. The bottle on the other hand feel so substantial and looks like a collector's item, it's definitely not your standard bottle of 99 cent polish from NYC (not that there's anything wrong with that). Hyde Park Place is a pale grey polish but there's definitely hints of lavender in this color. This was my first Nails Inc color that I picked up from the Sephora's sale section, so I have Hyde Park Place to blame for this obsession. The Gel Effect polishes are fantastic! They're very shiny, long wearing, and can be easily removed with any nail polish remover. The color lasted 2 weeks on my nails with little chipping, which was very impressive considering how much I type. Bruton Mews is a beautiful deep forest green, which happens to be one of my favorite colors to wear on my nails. 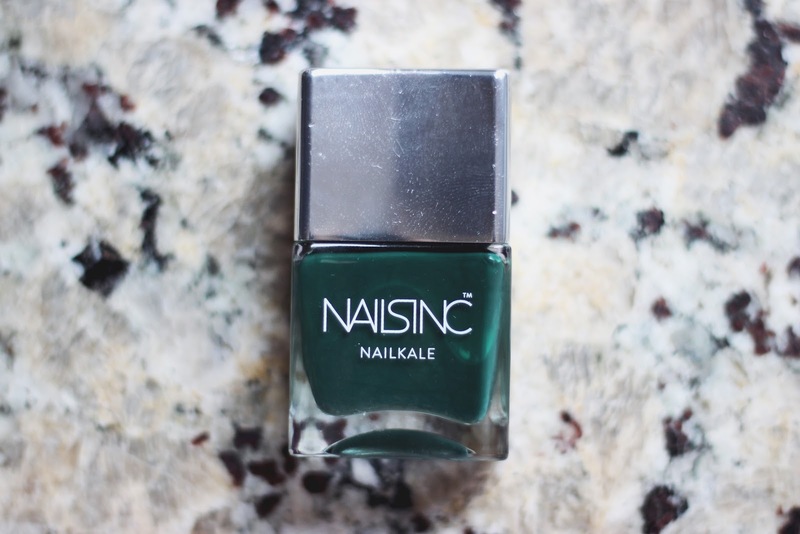 The Nail Kale nail polishes are supposed to be limited editon but they've been sold for what seems like a year at Sephora. As you can probably guess by the name, these polishes are infused with kale extract which apparently stimulates keratin production. The Nail Kale colors are also highly shiny, opaque, and as the cool kids say- it's long lasting AF. This color also lasted on my nails for two weeks with little to no chipping. Lexington Gardens is described as a lilac but to me it's a milky lilac, I don't know there's something about it that makes this color very unique. It's definitely more of a spring shade, but I personally love to wear bright shades when it's a bit gloomy outside. The Gel Effect formula is the same as Hyde Park Place, pretty much the biggest difference between the two is the presentation. The newer Nails Inc bottles embrace more of a minimalist design compared to this one which is quite busy. Colorwise, I love this! Now I regret not getting the periwinkle shade which I saw next to this one. Damn it! 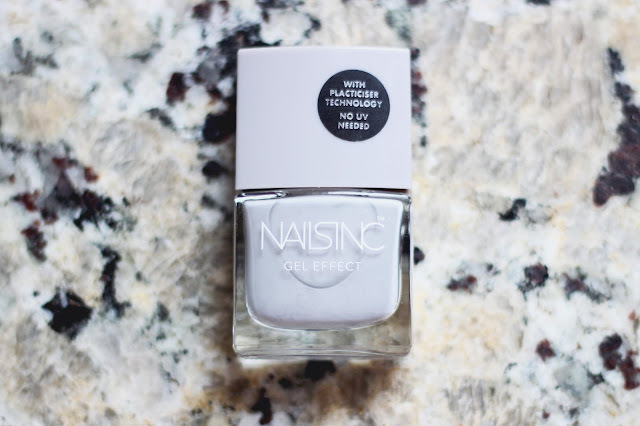 Have you tried Nails Inc? If so, which color do you recommend? Let me know in the comments below.